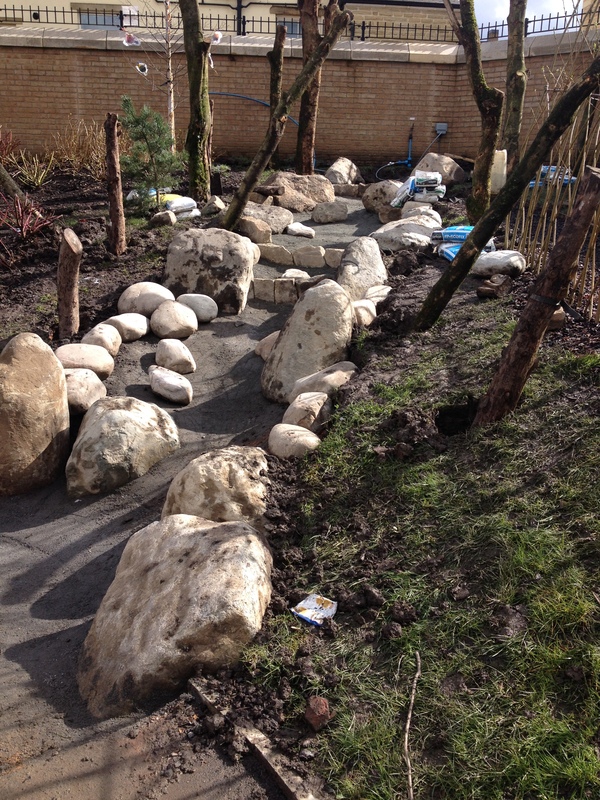 Our latest creation is bringing a little bit of the forest and stream into the school playground. We were approached by a school teacher who was particularly keen on the Forest School ethos – an inspirational process, that offers ALL learners regular opportunities to achieve, develop confidence and self-esteem, through hands on learning experiences in a local woodland or natural environment with trees. The school is surrounded by terraced properties and many of its pupils have never experienced a woodland or forest – so we are making them one in their very own playground. Designed and built in house we have created a terraced waterfall with pump and self feed water supply allowing the children to control the flow of water. The stone imported is glacial granite inset into a concrete bed. ”Unfortunately we can’t be totally natural when creating something like this, a little bit of cheating gets us what we need, said Nick Riley, our Landscape Architect. ”Importing large tree stumps gives that forest feel and an instant impact that we need. Children will be able to experience the feeling of a forest stream without having to pile onto an expensive bus with the rest of the class and travel a few miles towards Pendle perhaps”, he said. 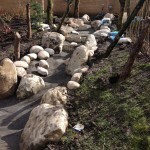 The stream feature is set in an ‘activity area’ within the school grounds. Here children will be able to create their own play in an innovative way that will stimulate the mind and sensory experience. They will learn from one another and hopefully grow to love what the outside has to offer. Ipads are great tools but hands and rocks and sticks are just as much fun and having to move around and interact and be active is what outside play times and lessons are all about. Working with this school is a delight and having teachers that are so keen on outdoor activities and not worried about getting muddy is inspirational. The children obviously love their school and the activities.